The fastest selling product on Amazon, and now in millions of homes. Amazon’s Echo products with the Alexa virtual assistant built-in, are now at the forefront of the new industrial revolution. Before you set off into the world of voice first applications, here are the top 5 things to consider. We’ve been building Conversational UX for 9+ years and worked with many of the best systems for some of the world’s largest tech companies. Looking for someone to help you with an Alexa Skill? 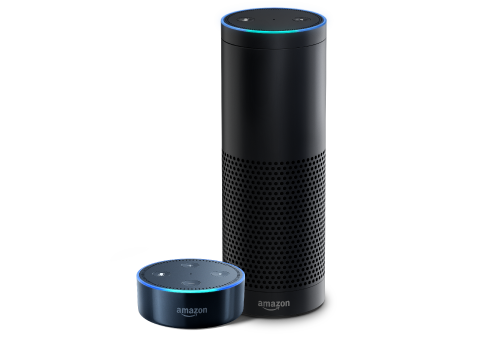 Our Alexa skills development services exploit the Amazon Echo, a real breakthrough product, producing possibly the most “comfortable” user experience we have seen so far in this new voice first revolution. With an open architecture approach, the Alexa ecosystem allows any brand to build voice first applications known as Alexa Skills, enabling engagement with customers like never before, in the comfortable setting of their own home. Although chatbots have been around for decades, Apple catapulted the Conversational UI into the mainstream in 2011 with the launch of Siri on the iPhone 4S. Alexa on the Echo has in many ways surpassed Siri by virtue of an elegant handsfree experience. As the ecosystem around Alexa matures, we’re seeing more and more companies develop ever more sophisticated solutions to improve their customers’ brand experience. Today might be more about playing music but we are already seeing sensitive services like banking available via Alexa, and just the starting point for the next paradigm in computing. The Amazon Echo has become as much a part of people's home life as their furniture, providing a user experience that is as comfortable as making a phone call. It's like having an open line to your customers. Probably the best 'voice first' device currently available. With little, if any, client side application, updates to intelligence are instantaneous. Enabling your application to be highly responsive to changing customer demands. Because this is server side deployment that requires very little client side implementation we can take an open architecture approach to repurpose many of the assets simultaneously across all channels (Apps, Twitter, Facebook, SMS, website, etc.). No Fancy APIs needed. Badminton Horse Trials is one of the largest outdoor sporting events in the world attracting hundreds of thousands of visitors each year. The Alexa skill we developed searches through 10 data sets and API services to enable complex conversational style interaction with Alexa to discover results, timetables, ticket and shopping data and myriad of other information for visitors and followers of the event held in May. We built 2 further skills to provide Echo users with access to live and recorded audio from the event. From checking your bank balance, the weather, news, or transport links to performing complex tasks, Alexa is providing the best user experience by far, and is saving customer and companies alike, valuable time and money. We’ve been building Conversational UX for 8+ years and worked with many of the best systems for some of the world’s largest tech companies. This is currently the largest tech area we are working on at the moment, as it ties in nicely with strategies to improve customer engagement through rich data. We have built some of the most sophisticated bots available and would welcome the opportunity to demonstrate what we could make Alexa do for your customers and you. Consultancy, and end-to-end skill development, leveraging Alexa's NLP technology, AWS, and your own systems and infrastructure for compelling applications. Need to start the ball rolling quickly? We can build out the first use case or two very rapidly, often bringing real iterative progress within hours, not weeks!